From several people who measured the amount of Saturday’s drenching downpours, the consensus is that we received about 4+ inches or 10+ centimeters all in the one day! With that and Tuesday’s rain, the Fire Danger has been lowered just a bit to HIGH – so please no campfires except for warmth and food. However, elsewhere, folks weren’t so lucky with fires…3 acres went near Canoe Channel in Carling…the inner channel near the Pancakes, where kids with fireworks were the culprit but the Carling fire department contained it…. 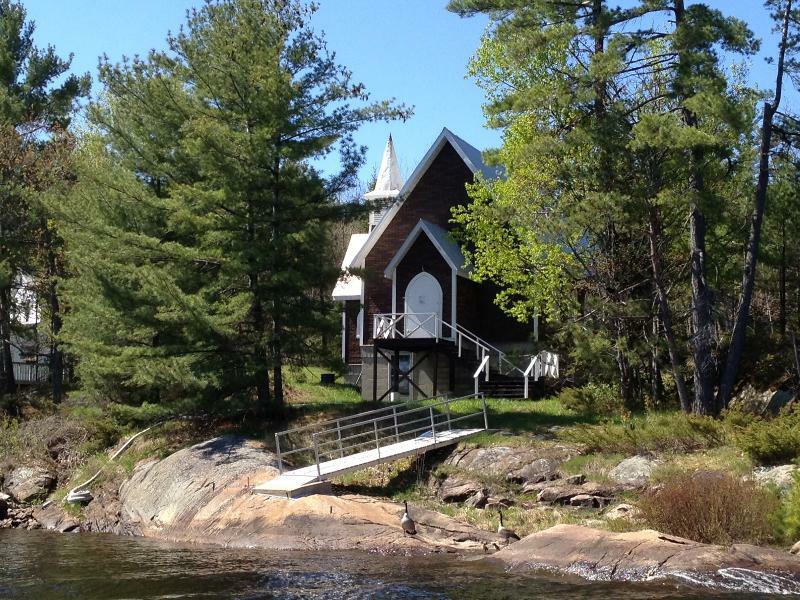 Then an island in Parry Sound’s Big Sound…the cottage was lost along with some of the island. Thankfully, 2 helicopters came in to contain that fire. A Chingwauk teenager on the move! This eaglet, captured in this photo (left) by Barry Middleton, still goes back to (or around) the nest everyday for food and to sleep at night. The daily flights are growing in distance and he/she is starting to find places to sit that gives a good view of the scenery. 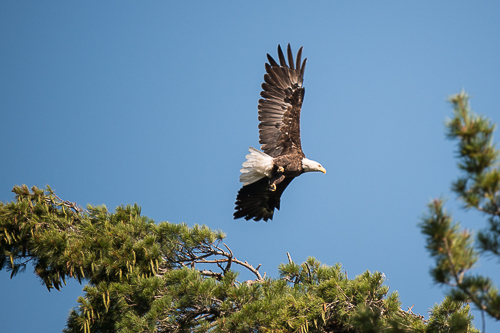 Many have asked about the two ‘Pontiac’ Bald Eagles with their 2 eaglets seen this year for the first time: Are these adult Bald Eagles the former eaglets from Chingwauk (A198-1)? Barry and Rebecca Middleton explain that the eaglets from several years ago are still too young to breed themselves. 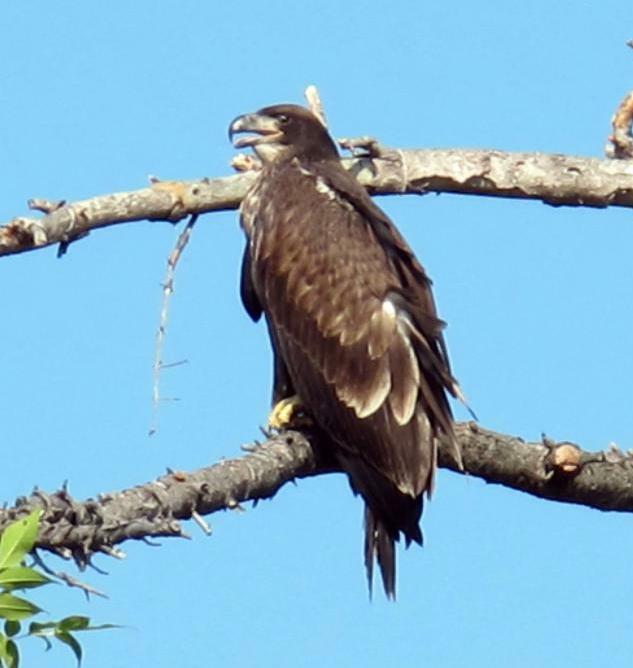 The eaglets need five years to grow to adulthood, during which time the feathers will appear as different colours while the molting process goes on. They will have a patchy look with the head and tail feathers slowly turning white and the eyes and beak turning yellow. The distinctive adult look (above with dark body, white head and yellow beak) is completed by the fifth year! Add some fun to your summer by joining the OFAH Ontario Angler and submit pictures of your catch for the summer to see how you stack up to others. We have also found some fantastic information on this website about Ontario Fishing. 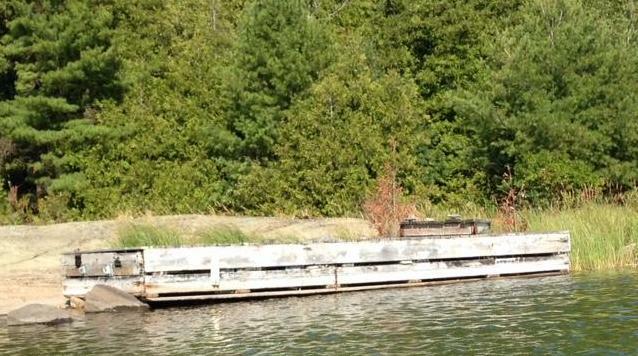 This dock floated to the western shore of our island, 330A (Addoms), some time before June 22 and is still there. It’s 20′ x 6 ‘ with a ramp. If it’s yours, please contact Sarah Whitener . 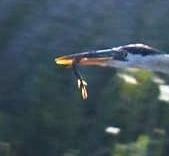 Thanks go to Marc & Sally Griffin who shared with us that they believe the Heron is carrying a baby gar fish which they have seen both in Frederic Inlet as well as out on Little McCoy Island. 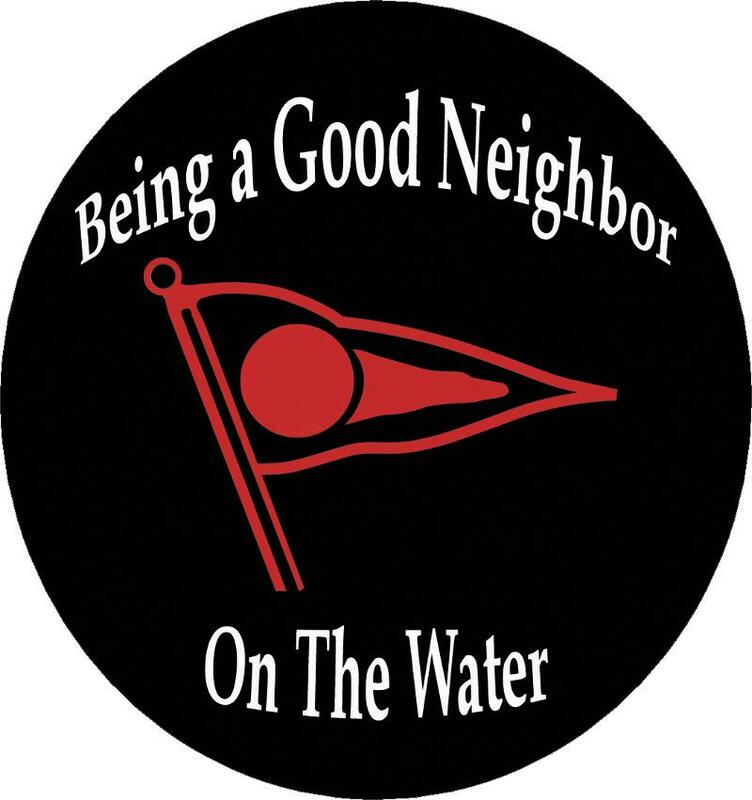 As dusk arrives earlier each night, please stay cognizant that using your boat lights from dusk to dawn is imperative for you to be seen out on the water by other oncoming boaters. More often as the days get shorter, we are hearing boats but unable to see them. It’s YOUR life, as well as that of others, that is at stake here! 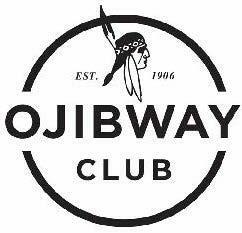 The Ojibway Club would appreciate your help in finding the next great General Manager for the Ojibway Club. The General Manager position provides a unique opportunity to spend the summer on the Ojibway Island, direct the daily operations of the club, oversee financial performance, liaise with membership and to be an ambassador of the Ojibway Club. We would kindly ask you to share the attached job description with your network and to please forward any qualified candidates to the search committee at ojibwayclubgmsearch@gmail.com. For the GM’s job description, Click here. In advance, many thanks! As you may know, the charter of the Ojibway Historical Preservation Society carries the responsibilities to plan and manage historical restoration projects on the Ojibway Island that serve the entire PaB area and to do so through funding provided by donated dollars. Some of our more recent projects have included: the Ojibway Grocery Store, an increasing network of Walking Trails with benches, the back beach Swim Pavilion, and one of the island’s most beloved rental cottages, Basswood. But each year a substantial portion of the administrative and overhead cost for the OHPS goes to printing and postage. To eliminate these expenses and put our donated dollars to better use, the OHPS Board has approved a process of converting our communications to a system that is more fully digital. In the future, we will be sending Historical Society information and updates on restoration projects, plans and campaign proposals via email and eBlast newsletter to the Ojibway community — including all of you who receive these PaBIA eBlasts. In addition to cutting expenses, this should facilitate our ability to reach you with more current information than through snail mail. If for some reason you would prefer not to receive emails from OHPS, please click here to send a quick email requesting to opt out of the OHPS digital communication program. Thanks for your continuing interest in our historical restoration efforts. Donations may be made anytime at the Church! Drop off by road or water. Questions? Contact Barb Leitch. Calling All Americans Who LOVE Our Cottaging World! Never has it been a BETTER time to support your Canadian Hospital! Why: Our LOONIE makes your tax receiptable USD donation a terrific bargain. If you direct your donation to the West Parry Sound Health Centre Foundation through the American Fund for Charities … Your generous support will come to us and a tax receipt in USD will go to you! To receive a tax receipt in USD, follow this link. Even Better: Your donation will be matched if you join our Northern Angel Council! The Family of Walling & Julia Ruby (long time cottaging family in Pointe au Baril) will match your Northern Angel Council donation in a campaign meant to raise new friends and an additional $500,000 for the West Parry Sound Health Centre Foundation. Details here. We NEED YOU: Since opening our hospital in 2005, all new and replacement equipment has been bought by donors. (To see what Donors have bought view here - FYI the CT Scan was bought by Donors 11 years ago and as it comes to end of life this critical equipment is now on our list to replace). Canadian health care does wonderful things but in our busy community hospital with extreme fluctuations in patient flow, we do not receive money for much needed equipment. Donors to the Foundation are key. ’It takes a community to maintain a hospital.’ If you haven’t already, won’t you join our community? The time is right to help … the financial reasons are compelling… the USD to our LOONIE stretches your hard earned dollar; the $500,000 matching gift from the Family of Walling and Julia Ruby makes your support double in value! We are at $186,490 of the $500,000 gift matched … please help us complete the $500,000 match by becoming a Northern Angel Council member. hospital care close to your cottage! 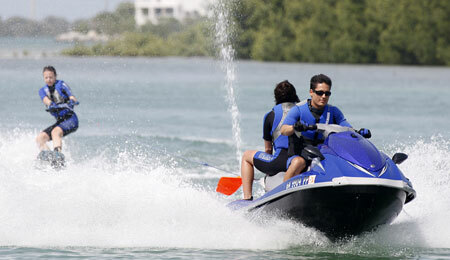 With more and more jetskis on the water and more and more people waterskiing behind them, please remember that, just like the rules for pulling skiers behind a boat, there MUST be a spotter on the Jet Ski, aside from the driver. PaBIA Sailing Race Begin on Saturday @ 2:00 pm! 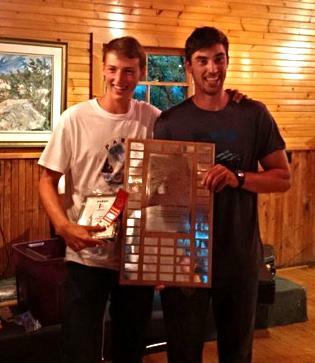 We had an action packed weekend with our annual regatta on Saturday followed by dinner at the Ojibway Club. 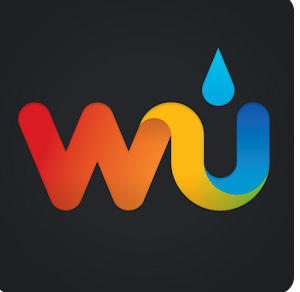 Kudos to the 30 dedicated participants and the Race Committee who braved torrential rains on Saturday afternoon. 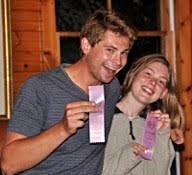 Congratulations to our regatta winners: James Tremayne & Michael Spiering (right) in the Albacore class, Bill & Leanna Foster in the Scots and Tim Bradshaw in the Laser class. To the left are Teddy ‘tHooft and Stuart Tremayne enjoying the festivities! Thank you to our Race Crew, the Bradshaw family, the Ojibway Club, Steve Sherk and all our volunteers – the regatta was a huge success. Our next race will be held on Saturday August 20th at 2 pm on the Turning Island Race Course. The Rendezvous will be hosted by Jim & Erica Curtis at Mahmaundah (A502) following the race. Check out PABIA’s website for course descriptions, race results and other pertinent information. See you Saturday!